I believe that your exploration into learning this amazing instrument should begin with an easy to play, yet good sounding and affordable stick. If for some reason you are unable to create your own didjeridu, consider these the best you can buy for the price. And perhaps my instruments will be the catalyst for you to MAKE your next didjeridu. These didjeridu's are hand made and painted by me. As I work outdoors I listen to traditional yidaki (didjeridu) recordings, infusing them with sounds of nature and origins of rhythms. Making locally and selling locally. If you do not wish to pay for shipping and handling and pay via paypal, contact me directly and we can meet in person. After much thought, I have decided to only sell my didjeridu's locally (Nevada County, Ca). I have met or plan on meeting those who buy these instruments and look forward to hearing the progress made in your exploration into this ancient sound. If you are inquiring from out of state and really want one of my didjeridu's contact me and I will set you up. I can also connect you to your local didjeridu crafter or a trusted international maker. 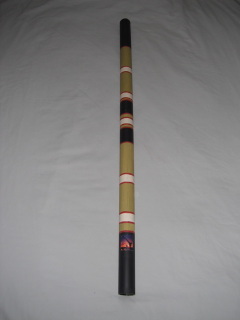 This didjeridu is a great stick for the little players in your life. Even though it is a small and light tube, I still have fun playing these didjeridu's and can express the same techniques that I do in my traditional Yidaki. This stick is by far the easiest for beginners of all ages. All didjeridu's in the key of G are 34 inches in length and come with a custom painting with plenty of room for you to add your "story" or design. The example here is indicative of my style of painting inspired by many of the Yidaki I have in my collection created by Djalu Gurruwiwi. They come with a built-in mouthpiece. All didjeridu's in the key of E are 41 inches in length and come with a custom painting with plenty of room for you to add your "story" or design. The example here is indicative of my style of painting inspired by many of the Yidaki I have in my collection created by Djalu Gurruwiwi. They come complete with a beeswax mouthpiece. All didjeridu's in the key of D are 46 inches in length and come with a custom painting with plenty of room for you to add your "story" or design. The example here is indicative of my style of painting inspired by many of the Yidaki I have in my collection created by Djalu Gurruwiwi. They come complete with a beeswax mouthpiece. All didjeridu's in the key of C are 52 inches in length and come with a custom painting with plenty of room for you to add your "story" or design. The example here is indicative of my style of painting inspired by many of the Yidaki I have in my collection created by Djalu Gurruwiwi. They come complete with a beeswax mouthpiece.